Pressure washing assures we have a substrate that is clear of dust, dirt, and pollution. We apply one coat of 30 second house cleaner If any visible mildew is growing on the surface. The amount of water pressure is determined by the type of surface being washed. If we are working with delicate cedar chokes, pressure is lowered to make sure shingles do not detach. When washing tougher types of siding materials, pressure can be increased. We always use an angled pressure washer tip to direct the flow down wards and prevent moisture from being forced under the siding. Drying time is determined based on temperature and humidity. On average, we wait one week to resume our preparation. Often painters are in a rush to complete project and start painting 1-2 days after power washing which can cause premature failure of the paint job. 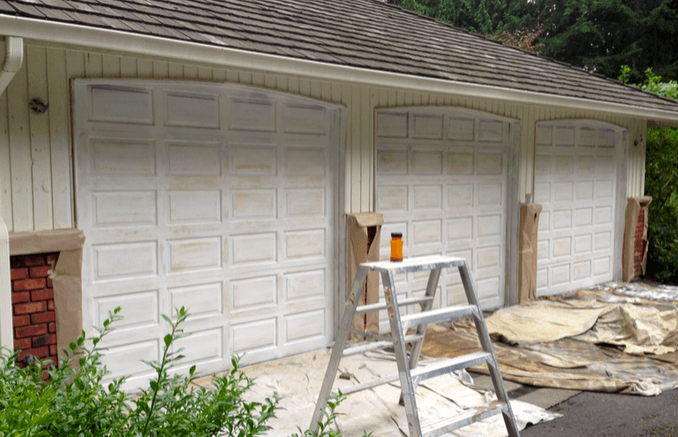 Preparing 20 year old garage doors to be painted for the very first time. Every project starts with masking and cover-up. We protect windows, roofing, walkways, plants, or any other surface that is not being painted. Exterior lights, thermometers, and other similar items are removed from the house, while other items, such as patio furniture are placed a safe distance away. While major sanding takes place after the primer is applied, we give a rough pass to the entire surface to remove any splinters raised by the pressure washer. Sanding dust is removed by dusters, vacuums, and powerful gas blowers. NOTE on lead based paints: this type of clean up applies to home build after 1978. 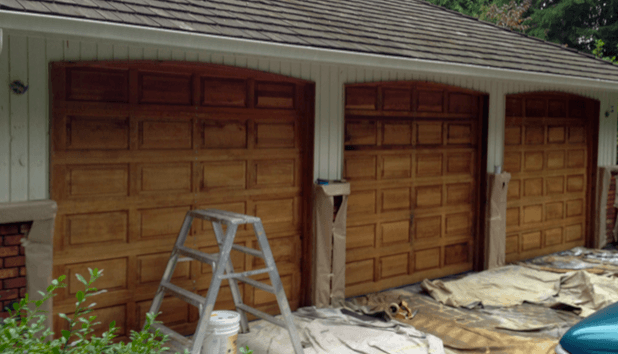 Once the surface is clean and dust is removed from the surface and surrounding areas, we apply our first coat of oil based exterior stain to seal the substrate. Primer can be brushed or spray/back/rushed to ensure proper adhesion. Drying time is determined based on temperature and humidity. After 2 coats of primer, and sanded before and after each coat. Once our fast drying oil primer is fully dry, we sand the entire surface to flatten cedar pores, and restore the surface to original condition as much as possible. Again, the surface and surrounding areas are clean of all sanding dust. Now we apply a second coat of oil primer and allow sufficient drying time. Back-brushing may be needed for rough surfaces. We back-roll the paint on the siding. While most painting companies believe a sprayed on coat suffices, Elegant painting takes durability to another level. Our application method includes bankrolling the entire siding twice. Paint is applied using airless sprayers, and is spread using rollers. Back-rolling forces the paint into the surface, filling all microscopic “moisture pockets”. Back-rolling also improves adhesion and produces an even spread. Gutters, corner boards, belly bands, fascia boards and other trim pieces are then hand painted twice using brush and rollers. 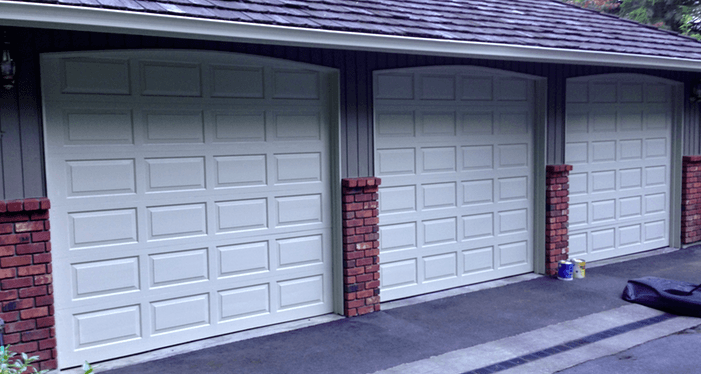 Posted in Procedures and tagged bellevue house painters, costs to paint fiber cement siding, deck stain, elegant painting kirkland, house painting sammamish wa, painting exterior door edges, peeling paint verge board, white house paint color.